Bridal fashions are getting simpler and more individualistic thanks to the stars of screen and stage. 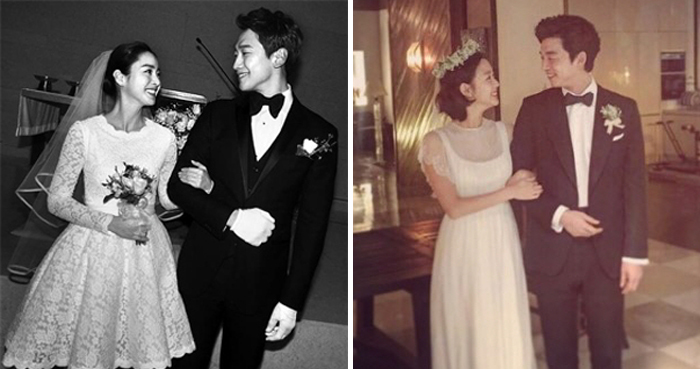 Actress Kim Tae-hee surprised label addicts when she wore a custom-tailored mini dress to her wedding to K-pop superstar Rain in Seoul on Jan. 19. Kim, who majored in clothing and textiles at Seoul National University, designed the dress herself. Just two days later, in the final episode of hit tvN soap "Guardian," stars Gong Yoo and Kim Go-eun got married in a small ceremony in a garden full of buckwheat flowers. The bride wore a simple dress that came down to the ankles and no veil, and just had a floral crown and a bouquet. The trend began a few years ago, when celebrities like Lee Hyo-ri and Lee Na-young opted for smaller, simpler festivities rather than the overblown fairy-tale number of the popular imagination. Wedding industry insiders expect Kim's mini dress to catch on big time. In traditional wedding dresses that come down at least all the way to the floor, often supported with stays and hoops, the bride's movements are heavily confined during the ceremony and at the party. Not only is a shorter and simpler dress more suitable for a smaller wedding, it also gives brides more freedom to enjoy themselves. Wedding venues are also moving from traditional wedding halls or hotels to cafes, restaurants, and outdoor areas. Dress shops accommodate a wider range of budgets. Lee Ji-hyo at occasion wear brand Reehue said, "As more people now host western-style parties after the ceremony, many people are looking for dresses rather than traditional hanbok." Many brides-to-be are getting a versatile dress tailored and occasionally wear it on other important occasions. Fashion designer Lee Seung-jin, who runs occasion wear brand ELJOY, said, "It's not about saving money, but it is about more people recognizing that a simple yet sophisticated wedding dress is trendy and chic. We are seeing a new wedding culture emerging."